Stay at home, you infernal ladies! Today I am deeply saddened by the denial of justice to Eric Garner and his family. The fact that this decision was handed down while the public has access to video footage of the murder shows a truly frightening disregard for even appearing to care about justice or equality. My prayers are with the Garner family today. This blog isn’t really a platform for discussing recent events in New York and Furguson,but I must say that I have been horrified at the willingness of many of my friends on the right to ignore statistics in favor of focusing on a single criminal, their willingness to make light of the plight of their brothers and sisters in the Lord, and their hardness towards families and communities with gaping holes left by police bullets and batons. My prayer is These Frail Hands by Brave Saint Saturn. We now return to your regularly scheduled disposal of bath water. Reason number 7 why you should start a “Faithful Women” ministry. Ok, this is cool, right? Strengthening marriages sounds like an excellent goal! And the verse talks about teaching women to love their husbands; another noble goal. We should be able to skip over this point, right? Ok, never mind. We’ll be here a while. First off, agape love is not love that is “founded in admiration, veneration and esteem.” This is more than a slight twisting of the meaning of words; this is categorically, factually wrong. Agape love is unconditional, self-sacrificing love. It is the love that God has for us. Did “God so love the world” because he admired, venerated or esteemed us? This statement seems strange and far out of left field even for Gothard. Secondly, phileo love is “brotherly love.” This is the type of love that exists between family members, or close friends. And it is so much more than an “inclination prompted by emotion.” As DC Talk so eloquently pointed out, love is a verb. It’s real actions. It’s washing the dishes and fixing the car and writing a note to put in the lunch box and setting down the cellphone to talk to someone. It’s calling to check that someone made it home on icy roads, or sharing your Dr. Pepper with someone (that one is tough for me.) It’s not simple an “inclination.” That word choice is downright insulting. 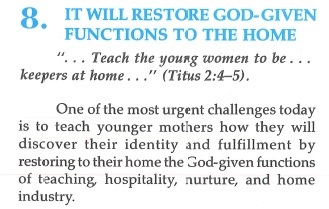 Thirdly, how the heck is an older women supposed to “wisely teach” this “inclination”? What on earth does that look like, in real life? I can’t even imagine it. Bleh. I have a headache. I’m going to drink my tea and go to bed now. “agapáō v. 1. to want to do good things for someone, such as to give them what they need, or protect them from harm. It’s still an open question of how to teach phileo love, that is, to teach people to be fond of their spouses. But it is something that Paul encourages in Titus 2:4.